Alice Cooper wasn't all bad. In 1881, she purchased a cow for the Orphans Home for "little ones destitute of milk," but she was better known for her notorious bawdy house. In 1893, Alice Cooper, a known prostitute, madam of a bawdy house on Florence Street and enticer of young girls into a wayward life, committed suicide by slitting her throat with a razor. Chattanooga's courtesans sent numerous beautiful flower bouquets as was the custom when one of their own died. "Despite the beauty and fragrance of the flowers, sin, debauchery and shame showed their finger prints at every point," The Chattanooga Times reported. Only a few attended her burial in Forest Hills Cemetery. 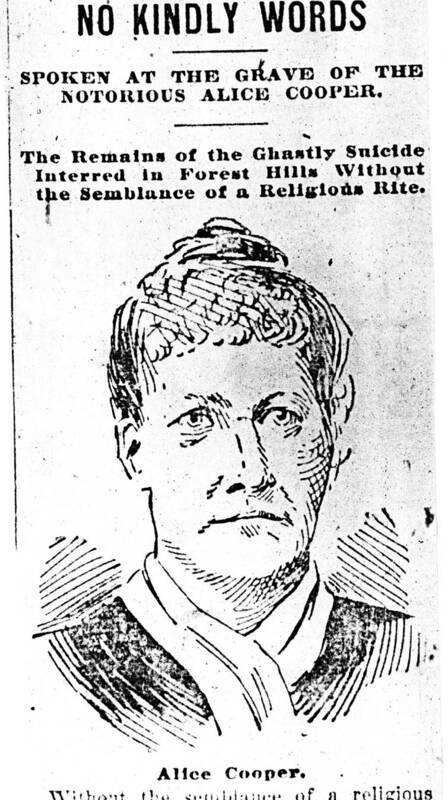 No preacher gave a sermon for Cooper, the "wickedest woman in Chattanooga." Only two people gave her kind words. One was Mandy Reeder, her cook, who said "she was good to me." Alice Cooper started life like many Tennessee women. She lived on a farm, got married to A.A. Cooper, who went to war. She was left a Confederate widow and sought her livelihood in Chattanooga soon after the Civil War. As operator of a well-known and popular house of ill repute, she achieved wealth and success, owning property on Fourth Street and Florence Street and had all "that one could want in the way of pleasure, ease and comfort." She wore diamonds and rode in a carriage. Maintaining her life was not easy as she was always in civil or criminal court. She was arrested several times, accused of robbery and procurement of young girls for her house of sin. She was the enemy of the law and of upright Chattanooga citizens. Not all she did was illegal or immoral. She raised money and purchased a good cow for the Orphans Home in 1881, a most gracious gift for the "little ones destitute of milk." Alice Cooper first appeared in Chattanooga papers in a court case Dec. 4, 1873. She was in the paper again in 1879, concerning the case of a pregnant girl living in her house. Alice could not board her, believed that the girl had been wronged and hoped someone would help her. Mrs. Cooper had treated her kindly but could not offer her a living. Madam Cooper first operated at 409 Broad St. (now the site of Ignus Glass Studio). She had to leave that area when the city required inhabitants of establishments on Broad and Fourth streets to move or be raided every night. She moved her house of ill repute to Florence Street, an avenue no longer part of Chattanooga due to the construction of Highway 27. Madam S. Walker and Madam M. Morris also had bawdy houses at 11 and 13 Florence St. Their places were close to the railroads and saloons but not so close to proper folk. In 1881, Mrs. Cooper was in the paper when one of her clients, a "respectable" citizen of Charleston, Tenn., accused her of robbing him. He had "mistakenly" come to her establishment, he said, ordered drinks, passed out and awoke to find Mrs. Cooper secreting his wallet. She claimed that one of her staff took the money. The court later charged her with the crime. Again and again, the police arrested Alice on charges of running a bawdy house and of enticing young girls to enter prostitution against their will. She was stabbed in 1882 by one of her clients, who again claimed that he was robbed in her house of ill fame. She protested against this defamation of her character with a letter to the editor. In the arrest of 1886, the bold landlady insisted that she was running a hotel and produced a license to prove it. Most of her girls testified to serving as chambermaids, cooks, scullery maids, etc. One young lady, however, refused to lie, and Madam's efforts to avoid conviction were thwarted. Each girl was fined $4, and Alice was fined $15. Madame Cooper promptly swore out warrants against the police chief for trespass. Alice Cooper left no note when she died. During the last five years of her life, old age, poverty and disease haunted her. "She died at the age of 63, and the pace she had gone left its imprint on her wrinkled and hardened face. Her house of ill fame had always carried the reputation of being the wickedest den of infamy in the city, and when it flourished at its best, it was not equaled for disorder in the country." Today, Alice sleeps quietly in Forest Hills, where you can sometimes visit her during the annual cemetery stroll. Suzette Raney is a librarian and archivist at the Chattanooga Public Library. For more information, call 423-757-5317 or visit the library.